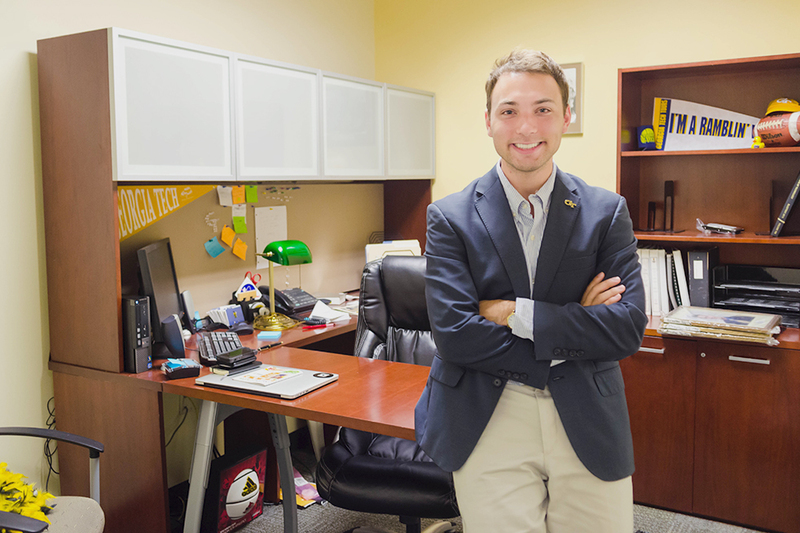 Dillon Roseen, fourth-year Public Policy and International Affairs major, serves as the student body president and leads the Student Government Association (SGA). Having served previously as the SGA Vice President of Internal Affairs, Roseen plans on making changes to the internal structure of SGA in the hopes of better serving the student body. Roseen has several ideas for the 2014-2015 school year and has worked with his team over the summer to make progress on several of these goals. Technique: What do you think are the most important initiatives that you and Brandi will tackle this year? Dillion Roseen: We plan to improve the student experience. One of the big goals we have this year is to use SGA as a vehicle to improve the student leaders within the organization as opposed to directly hiring leaders. We have also restructured the executive branch to add a Leadership Endowment Chair. We also focused on incorporating more of a service component for GT 1000 classes by creating philanthropy projects to promote more class unity and Tech traditions. I also met with Drew Jacoby, the UGA Student Body President, and we discussed the relationship between Tech and UGA. We hope to promote more unity between the two schools, especially since we are the major research institutions in Georgia. The goal is to focus on an “up with the white and gold” mentality instead of a “down with the red and black” mentality. Hopefully, we can maintain our rivalry on the football field and still be friendly. Technique: What about your new job working with external affairs and students most excites you? Roseen: I’m most excited to serve as the representation of what SGA is doing to improve the student experience. At the end of the day, if we are doing something that is positive for the student body I think that is the most important thing. Whether or not SGA is recognized for that is secondary. We also created a new communications team so people know that if they have concerns or comments they can come to us. Currently, I’m excited to work with media groups and speak to the freshmen class, as I love sharing what SGA is doing for Tech and the student body. Technique: One of the most interesting parts I thought about your campaign last year was that you promised to have a direct contact with the student body. What kind of things do you plan on doing to follow through on this promise? Roseen: We are developing a new website called “We the Students,” which is modeled after “We the People”, a White House petition forum where people can write about an issue. If that issue receives a certain amount of support from others, then it will be addressed by the White House. The “We the Students” portal would be a way for students to showcase issues that are affecting them on different areas of campus; SGA would then respond to these issues on the portal. We plan on releasing the website at the end of this year for use next semester. We are still trying to determine what level of student involvement will merit a response by SGA. We also have a social media chair who plans on reaching out to students about the new website, while we can partner with other organizations to publicize the website as well. Technique: Another initiative that stood out about your campaign was your plans for addressing sexual violence on campus. What have you done this summer with regards to the sexual violence task force and what do you plan to do in the future? Roseen: We worked a lot this summer on the sexual violence task force, and we created a list of recommendations to address this issue on campus. An ad hoc committee was also formed to make sure these recommendations are making progress throughout the year. We have also planned for a video campaign to help use male voices as a way to combat sexual violence. As a campus with over 60 percent men, we have a unique opportunity to be a leading institution where the men can be a part of the solution. Technique: Earlier, you had mentioned SGA’s online initiatives. What efforts have you done to improve SGA’s social presence? Roseen: We’ve used Reddit, Facebook, and Twitter more to communicate with students while receiving feedback. I’m not a big Reddit user myself, but it was really interesting to look at that thread, just because most of the comments there were so candid. Technique: With regards to the academic calendar, what changes have you guys made, and when do you think they will be implemented? Roseen: The progress for the academic white paper and the administration and staff are on board to going through the steps to implement these changes. However, we do not have a specific date just yet. SGA continues to provide the student perspective that can be lost in administrative meetings. We work as partners with the administration who very receptive to concerns. The earliest changes will be made in the next couple of semesters. The drop deadline and tweaking the dead week and finals week layout were very well received. Having a wrap around finals would give students a few days and another weekend to study for finals or just to relieve stress before taking exams.